\"Longsword of Embers\", a custom, unique fire damage-dealing weapon. It\'s an asset for use in the Legends of Grimrock dungeon editor. Basically, don't say you made it? Use as you please in Grimrock mods, modify stats/name/description as you need. 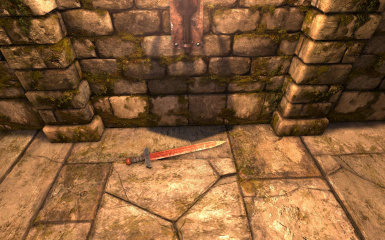 This is a re-textured version of the Long Sword in Grimrock. It has been modified to look as if it was fiery hot and deals flame damage. It's slightly stronger than the long sword, but weaker than the cutlass. You need to have started a mod in the dungeon editor to use these files. 1. 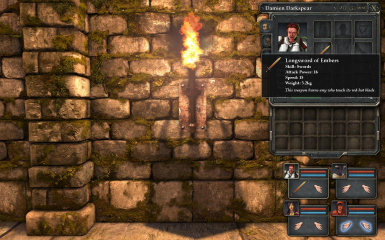 Begin a dungeon in the Dungeon Editor. Name it anything you like. 2. Copy the models and textures folders inside the Embersword folder. 3. Paste the models and textures folder to your dungeon folder. 4. It will ask you if you want to merge the folders. You do. 5. Go into the scripts folder. Open items.lua and materials.lua in Notepad++ or the text editor of your choice. Copy the definitions in those files to the items.lua and materials.lua found in your dungeon's "script" folder. 6. Open or Reload your project in the editor. You should see ember_sword in the asset browser. Have fun!